A perfect cup of coffee? Does the perfect cup of coffee exist? Only your nose knows. Among coffee connoisseurs, perfection is often defined as coffee that tastes as good as it smells. The experts at Intelligentsia Coffee & Tea say these simple tips can help you brew a truly great cup of coffee. 1. Use the best beans. Coffee is ranked on a hundred-point scale. According to industry experts, only coffee that scores 80 points or higher deserves to be rated as "specialty coffee," and only coffee that scores 90 points or more can be classified as "outstanding." You can check out Coffee Review for a list of high-scoring coffees in your area. 2. 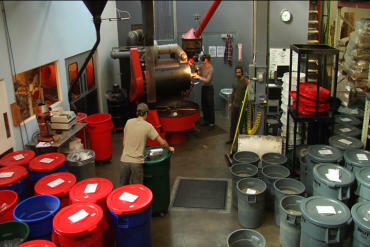 Grind it yourself: Coffee's flavor comes from natural oils trapped inside the bean during the roasting process. Once coffee is ground up, those oils begin to dissipate. So if you grind your coffee the night before to save time, you're actually getting a less flavorful cup. Most professionals use a burr grinder, which allows for a more consistent grind. 4. Timing is everything: Each method of making coffee has a precise brew time; letting your coffee brew too long allows the hot water to extract too much oil from the ground-up bean, creating a bitter brew. Too short a brew time and you get a thin, flavorless beverage. Total brew time for most methods is 3 ½ to 4 minutes. 5. Let it cool and leave it alone: Coffee is a hot drink, but allowing it to cool slightly will reveal the true flavor of the beverage. And as for all that milk and sugar? Save it for dessert. Really great coffee doesn't need anything to enhance its distinct flavor. 6. Moderation is essential: Caffeine is one of the primary reasons people drink coffee, but according to Kyle Glanville at Intelligentsia, caffeine is a natural poison -- the coffee tree's defense mechanism against predators. When a person drinks too much coffee, it begins to taste bitter. That's your body politely telling you to please stop poisoning yourself. The folks at Intelligentsia would be the first to say that they haven't yet discovered the perfect cup of coffee -- the one that truly mimics the amazing aroma experienced when you stick your nose in a bag of fresh-roasted coffee beans. But they sure have fun trying. If you want the specifics of how to make a great cup of coffee at home, they have a great mobile app with step-by-step directions for all methods, and even a brew timer. As for me? I'm going to kick back, relax, and have another cup of truly great coffee.